Elk Cove Inn & Spa is a Northern California bed and breakfast, elegantly set on a cliff with a breathtaking view of the Pacific Ocean. Families, couples, and pets are welcome at this bed and breakfast 150 miles north of San Francisco, on the famous Highway One. Elk Cove Inn was built in 1883 as a Victorian mansion and has a sweeping view of the Pacific and a driftwood beach. In 1968, the mansion was transformed into a bed and breakfast, and guest cottages and a gazebo were added to the property over the years. The property is set back from the road and is surrounded by native trees. Guests can look out to sea for migrating whales and local sea otters, or relax at the inn’s day spa. All rooms feature beautiful views, and many have fireplaces. Guests are welcomed with a gift basket containing homemade chocolate chip cookies, fruit, and wine. Free champagne is served with breakfast, and free cocktails and wine are available in the mansion’s lounge every afternoon. All of the rooms have Wi-Fi, and most of them have satellite TV. There is no charge for local and long-distance calls within the U.S. and Canada from the phone in the lounge. All guests can use the lounge in the main part of the inn, which is equipped with a coffee maker, a microwave, a fridge, a TV, and a DVD player with a selection of videos. Board games and books are also available. All guests can enjoy wonderful views from the rooftop terrace. The property has sixteen guest rooms in four different categories. There are six guest rooms in the Victorian mansion itself, featuring either ocean or garden views. 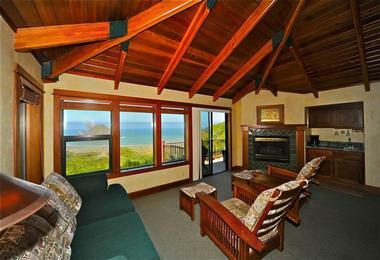 Ocean views are available from the Baywatch room or the Seascape room. Located on the second floor of the mansion, these rooms have king beds, gas fireplaces, and sitting areas. The Baywatch room is decorated with Ralph Lauren textiles and colors and has a tub and shower. With a large panoramic ocean view window with a window seat, the Seascape room is decorated in Tuscan hues and has a shower only. The other rooms in the mansion have views of the inn’s gardens and they are located on the first floor of the building. If you want a king-sized bed, ask for the Cypress Garden room; the other garden view rooms have queen beds. The two Carriage House rooms have coffee makers, microwaves, TVs, and fridges. The Hideaway room has a king bed, an oversized shower, an electric fireplace, and is pet-friendly. It is also wheelchair and walker accessible. The Wave Watcher room is the newest room in the inn. It has a dramatic view of the Pacific, an oversized tub and a separate shower, a king-sized bed, and an electric fireplace. The mansion also has four oceanfront junior suites. All of them have oversized tubs with water jets, oversized showers, a private balcony or a stone patio, recliners, coffee makers, microwaves, fridges, TVs, CD players, and elegant toiletries. Each room has a king or a queen bed with an additional pull-out sofa bed, gas or electric fireplaces, and arts and crafts décors. Two of them have open beam cathedral ceilings. There are four oceanfront cottages, all of which are quiet, with cathedral ceilings, large picture windows overlooking the Pacific, coffee makers, TVs, microwaves, and fridges. The Cliffside Covey cottage is built on two levels, and has a queen bed, a shower, a sitting area, sage and rust décor, and a gas fireplace. The Surfsong Cottage has a queen bed, a tub/shower combo, an electric fireplace, a large window seat, and a white and ocean blue color scheme. 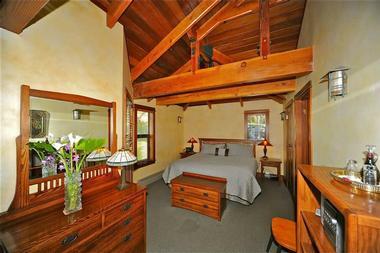 The Greenwood Cottage has a shower, a woodstove, butter and cream décor, a skylight, and redwood floors. Its crowning point is a Cherrywood queen-sized sleigh bed. The Bavarian Cottage has a Cherrywood king-sized sleigh bed, a skylight, white and teal décor, a shower, and a wood stove. The Elk Cove Inn Spa features traditional treatments combined with a commitment to organic, cruelty-free products. Have a relaxing massage yourself or in tandem with your partner. Special massages are available for expectant mothers. Hot stone therapy is available to melt away tension and stress. If you prefer a completely non-invasive treatment, go for a Reiki session that uses healing energy to relieve knots and tension. Relax in the steam shower or sauna, which are are big enough for couples to use them together. Facial wraps with organic ingredients are available in combination with the spa’s massages. Elk Cove Inn is a beautiful location for a small wedding of 40 guests. The staff can help you arrange officiants, photographs, champagne, cake, and flowers, or you can supply your own. A marriage proposal package is also available for those who wish to ask the most important question of their lives against a stunning ocean background. A proposal package includes two night’s stay in an ocean view room or cottage, a tray of champagne and chocolates, a large floral arrangement, a small celebration cake, a champagne breakfast in bed, and a spa voucher. You may choose to have photos taken or a violinist serenade you. Elk Cove Inn is a short drive away from some of California’s most beautiful sights. Birdwatchers and lovers of nature will enjoy Jackson Demonstration State Forest, where redwoods tower, and black-tail deer and Roosevelt elk dwell. The area is populated with raptors and seabirds. The Mendocino Coast Botanical Gardens are a place where you can spy hummingbirds, cormorants, and osprey while enjoying the Mediterranean-style garden with camellias, rhododendrons, and magnolia blossoms. 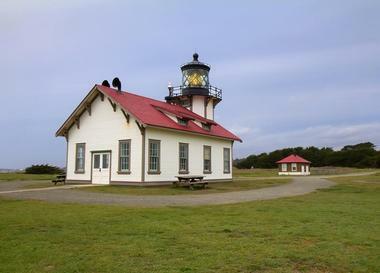 Beaches dot the coastline, and the historic Point Cabrillo Lighthouse is open to visitors. Whether you wish to golf, cycle, hike, try your hand at ocean canoeing or kayaking, swim, or visit the local wineries, Elk Cove Inn is a great starting place for your Northern California adventure. 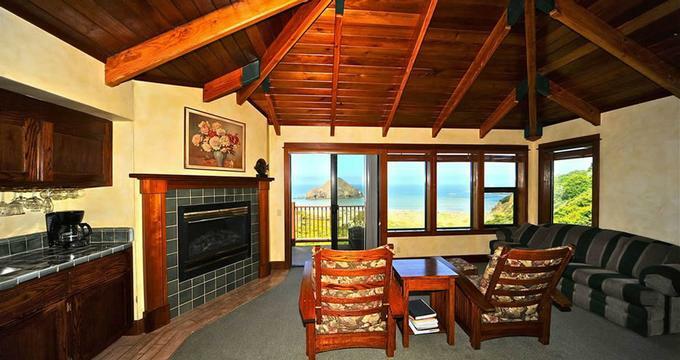 Elk Cove Inn is a wonderful place to enjoy Mendocino County’s wide variety of offerings, which include bird watching at local state parks, taking in the gigantic trees in the neighboring redwood forests, or visiting galleries, shops, lighthouses, and piers along the coastal road. Excellent restaurants are nearby, on the coastal highway, or in Mendocino which lies 15 miles north. Breakfast includes egg dishes, pastries, fruits, quiche, biscuits and gravy, coffee, and juice. You can also choose to start your day with free mimosas. Rooms start at $100 per night, suites from $345. Browse more great Weekend Getaways from San Francisco.